I hope you have enjoyed my travel snippets from Asia over the past week! If there is one thing Seoul and New York have in common, it is in the intense winter chill. 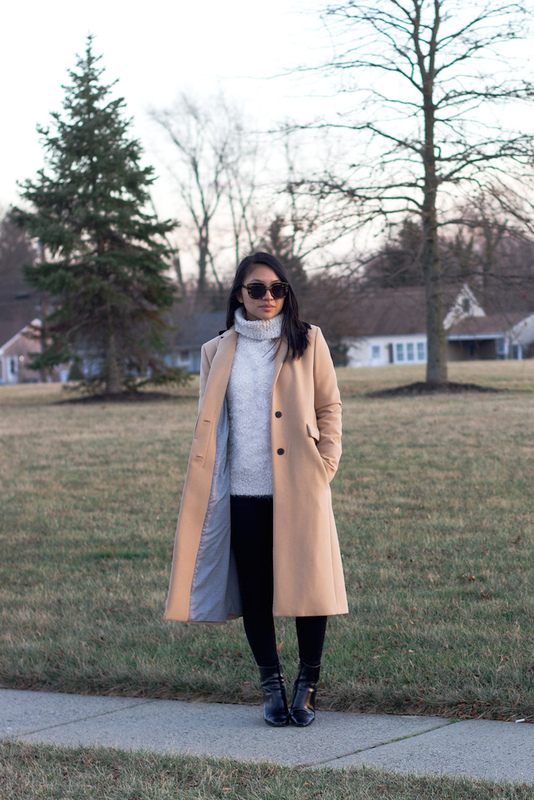 This kind of weather calls for the chunkiest knits and oversized coats -- in neutrals, of course. If Winter Storm Jonas cooperates, I will be flying off on a month-long European adventure tonight with just a backpack of belongings. It is just the send-off I need before joining the 9-to-5 world. While this means I will be leaving my laptop behind, I will try my best to upload some phone updates to the blog as often as possible. If not, you can always find me on Instagram! I apologize in advance for any blogging absence that may occur, but I promise there will be some awesome content to come once I return! Here's to the adventure of a lifetime. Europe, here I come! Have fun, sounds very exciting. I love the chunky knit and your boots are stunning. Congrats on planning that amazing trip! Sounds more than awesome! +that coat looks superb on you! That sounds great ! love the coat! ADORE THIS WHOLE OUTFIT! You look so fabulous and honestly so chic. I too tried those boots on but unfortunately they looked awful on me - they look so cute on you! The coat is a dream. Great post, great blog! Wow! Cheers on the amazing travel! That sounds like a great adventure. Have a safe flight to Europe. Btw, i love your camel coat so much. Perfect coat, lovely this look. Gorgeous outfit. I love that coat. Hope you have a safe and fun trip to Europe. I can't wait to see photos and hear about your trip when you return. Totally loving this classic look. Your camel coat is beautiful. Looks like such an exciting trip! Can't wait to see pictures! LOVE the camel coat! it's so chic! You'd be gone by now but have a safe trip dear x Can't wait to see bits of yoru Europe trip! Oh yes, in neautrals, of course.